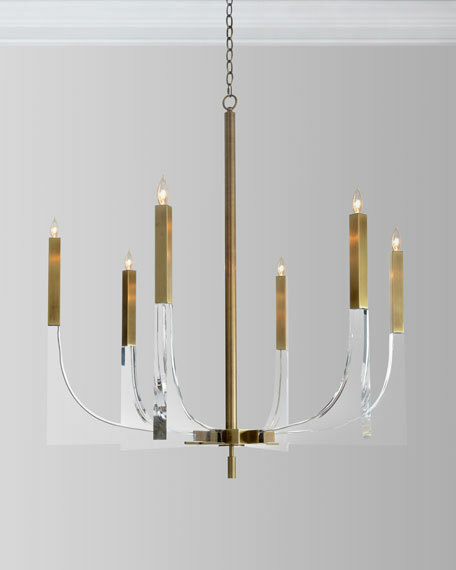 Classic form meets graphic modern design in this 2 tier acrylic and antique brass, 6 light chandelier. The chandelier takes 6 60 watt, type B bulbs. Acrylic and iron chandelier with antiqued brass finish. Uses six 60 watt, type B bulbs. Canopy included, 6"W x 1"T.
Chain, 10 ft.; wire, 12 ft.
Approx. 30"H x 30"W x 30"D.
Back plate: 6" x 1". Weight, 31 lbs. Boxed weight, approx. 51 lbs.